After attending an awards event last night where people were recognized for their contribution to their organizations, their profession and their community I was inspired to give some further thought to the concept of recognition. What is recognition? Is it important? Why do we do it? Who should initiate it? How do you do it? When is the best time to do it? Is there a way that works best? For many these are questions worth pondering before integrating recognition into your organization. There are various responses to this question depending on who you ask. I was once told by someone that recognition is “when someone is provided acceptable remuneration for a task or job where both parties feel the exchange is equitable. “ Would it surprise you to learn that this particular leader was a strong proponent of scientific management (Taylor 1911)? Through the acknowledgement of such a comprehensive scope we are able to answer the question “Is it important?” with a discernible yes. This question is answered differently depending on who you speak with. Some people will explain that recognition is important because it’s a nice thing to do and it makes the recipient feel good. Others will provide more strategic responses indicating the reason to provide recognition is out of the desire to manipulate control over others. In both cases, there is truth to what they say and potential to succeed. Why someone provides recognition can vary depending on the desired results of and the personality of those providing the recognition. The common outcome in either situation however is the increased satisfaction of the recipient and motivation towards higher levels of performance. Understanding the extensive influence this concept maintains within today’s organization truly allows us to envision its prevalence in our daily lives. 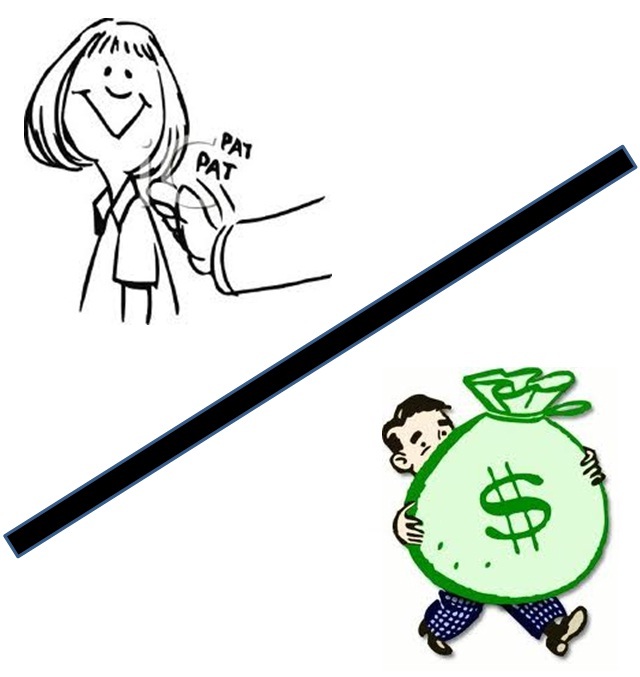 Through monetary recognition people are compensated in a variety of ways to either reward positive behaviors or encourage desired behaviors (Taylor 1911). Through social recognition people are encouraged or discouraged to continue or modify their behaviors as well. Such recognition will typically draw on a person’s social needs (Maslow 1943) or intrinsic needs (Herzberg et al. 1959) instigating them towards higher levels of performance. Another reason for providing recognition also includes the desire to reduce the risks associated with psychological distress in the work environment as illustrated in a more recent 2003 study, (Brun and Biron 2003 cited in Brun and Dugas 2008:717). A common question received is “who is responsible for providing recognition?” It should never be discouraged for anyone who wishes to provide recognition on a social level. Leaders may provide recognition in order to inspire others to higher degrees of work performance. Peers may provide recognition that inspires a greater sense of unification amongst a team. Subordinates may provide recognition to a leader that inspires them to continue reaching for new heights and provide direction in a manner that continues to drive their success. There may be some ethical considerations to ponder however if it was found that monetary recognition was being provided to managers from the employees. When used ethically recognition can be used to evoke feelings of belonging, confidence, appreciation and commitment within the recipients. How do you do it and when? Is there a way that works best? Unlikely there would be a universal way of recognizing anyone for every potential situation that may warrant recognition that all people would find suitable to their needs. It’s best to understand the gravity of the situation and the nature of the person to be recognized. Some people prefer not to be highlighted publicly and may appreciate a private form of recognition while others may prefer to be the center of attention for a moment. Understanding how someone would prefer to receive their recognition will also assist in understanding when the best time is to provide it as well. Typically however social recognition is provided right away in order to maintain the relevance of the noteworthy circumstances while any monetary recognition is often more difficult to procure immediately and may require more time. In circumstances where monetary recognition will be received it is common practice to provide social recognition first and more immediately in order to impress on the recipient the nature of the circumstances that have led to their receipt of a monetary form of recognition later. The nature of recognition is broad in scope as is its reasons for use. Its many different uses however are typically to nurture needs that inspire higher levels of commitment and/or performance. Everyone is capable of providing recognition and again may want to do so for a variety of reasons. In considering how to provide recognition the perceived ethical boundaries should be taken into consideration. There are a variety of methods used to provide recognition that include monetary and social recognition. Typically in circumstances where monetary recognition is to be received it is suggested that social recognition is provided first. This is a common practice that assists the recipient in understanding and remembering what behaviors warranted the recognition to begin with. I hope this helps illustrate the nature of employee recognition and provides insight in how recognition can be used in ways that might assist in fostering positive employee relations. This entry was posted in Compensation and Benefits, Culture, Employee Relations, Human Resources, Motivation and tagged Coaching, Communication, Compensation, Employee Relations, Human Resources, Leadership, Management, Motivation, Performance. Bookmark the permalink. Thank you Tanya, I appreciate the feedback! Have yourself a great weekend! Great post Colin! I love how you simply lay out the what, why, and how of Recognition. Have you read Daniel Pink’s Drive? I’d be interested in your thoughts on it, and the difference between “If, then” and “Now that” rewards, motivators etc. Thank you Pam! I can’t say I have read that yet, but I will be sure to add it to my reading list and let you know what I think. Great article! Over the next few months we are going to be re-vamping our recognition programs and this has given me some food for thought. Thank you! Hi Kelsey, glad you found it helpful. Thanks!